Home / Militaria, collectibles, insignia, buttons etc. / WW2, Finnish army, Officer shoulder lions. We got lucky, and obtained few pairs of nice original insignia for war time uniform. We got these from a named war hero, who obtained these in 1944 just before the war ended. These are 100% original, 1936-1945 style army / navy / air force insignia in best possible condition as these can be for 80 year old items. There is some stains, scratches, and some darkening, and other little defects that are caused by the long storage time. These are not the most common find anymore, as the army used all of these after the war and made new ones, these lions are still in use in Finnish navy but new versions are far more thin and finely made. The soldered pins are in perfect shape, it is possible these are unissued. 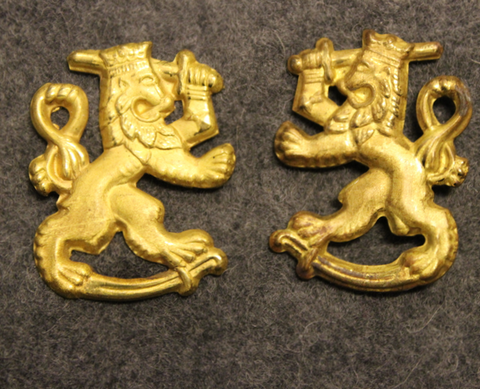 The other lion is bulkier and there are double pins in each end, which was common in 1940´s, you can find these lions from the shoulders of commanding officers. Some storage scratches are present. Finnish home guard, cockade: Newland Southern district.